Bakio, sea, mountain and country side all in one. We have the longest beach of Biscay, clean water registered as blue flag, with all the facilities for your enjoymen, including water sports, especially those related to surfing. We also have got mountains for walks through forests. Mountain bike is also offered. Two routes are defined, medium-high demand, with the names of two historical cyclists in the area: Valentín Uriona and Jesus Lorono. remain. Mostly white wine but the famous "Txakoli gorri” (red) and the variety "ojo de gallo"(Pink) are still produced.There are currently four wineries: Abio, Zabala, Gorrondona and Ados. Nearby, you can enjoy San Juan de Gaztelugatxe protected biotope and the Urdaibai natural reserve. A little bit further, you can visit Gernika, with its symbolic tree of liberty. Guggenheim Museum, the Ethnographic and Fine Arts Museums with one of the best art galleries. 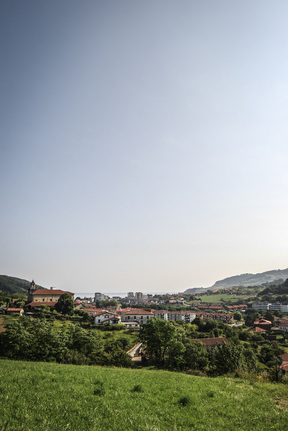 Basque quality gastronomic offers are well known worldwide, from tapas or pintxos to famous chefs restaurants.